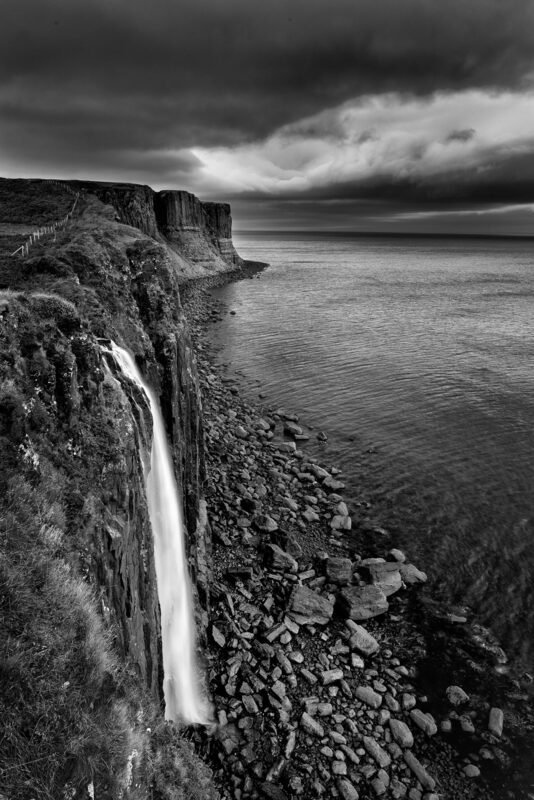 The Isle of Skye in Scotland can be a photographer’s heaven and/or hell. Sounds strange? Let me explain! 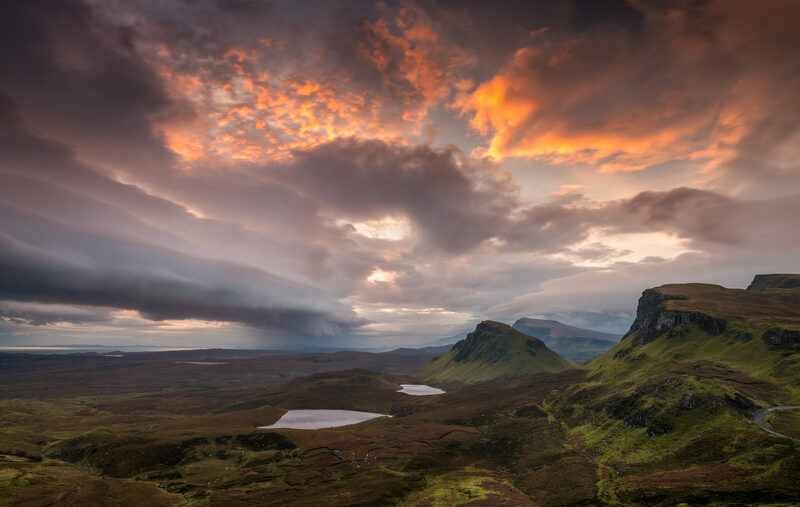 When the Isle of Skye is good, it’s great. There are few places on earth which can match it for the number of dramatic scenes crammed into such a small area. 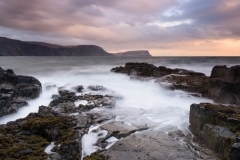 All locations on the Isle of Skye can be accessed within an hour’s drive at most. I recommend basing yourself in Portree or Sligachan which are very centrally located. How can such a location be hell for a photographer. If you are like me, time available there will usually be restricted to 3 or 4 days at a time. With so much to choose from you need to pick where you intend to shoot carefully. However, the weather can close in quickly making shooting anything next to impossible. This is exactly what happened to me on my first trip and the frustration experienced was overwhelming. I needed a second trip to get some of the locations shot a shot I’d have liked. Not being able to get an image is something all landscape photographers deal with more often than not. Factor in a limited window of opportunity and it becomes painful to bear. I will be visiting for many years to come to get all the images I want. I fly in to Inverness airport and rent a car. A spectacular 2 hour drive will have you in the centre of the island. With the exception of a 10 mile stretch, the roads are generally quite good. The alternative for me is a ferry from Ireland which would involve a 12 hour trip and eat up fuel. It works out cheaper and faster to fly. I visited for the 1st time at the end of October and the foliage was just perfect as regards colour. Unfortunately, I did not get the weather I had hoped for. I visited again in late January. Both trips yielded some great images. I recommend two camera bodies (one back-up), a tripod, a 16-35ml, a 50ml and a 70-200ml range of lenses. As usual, a full set of Lee filters ranging from 3, 6 & 10 stop neutral density filters, hard & soft graduated nd filters and my trusty polarizer are in the bag. Rain covers and lens clothes fill the bottom of my bag. 64GB & 32GB CF cards are backed up by the same denominations of SD cards so I immediately have two raw copies of every image. This negates the need for a laptop. I recommend a backpack over a shoulder bag as I there can be a bit of hiking. 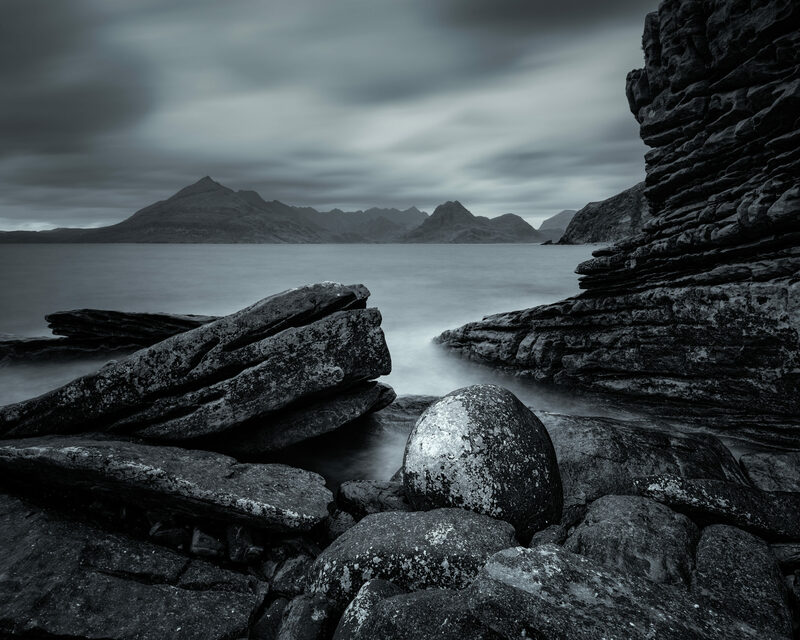 Its a personal choice really and I like to give myself options – if you are stuck for space, one wide lens and some top quality filters is all you need in 80% of the situations I came across on the Isle of Skye. We’ve probably all seen this location at some point in time. 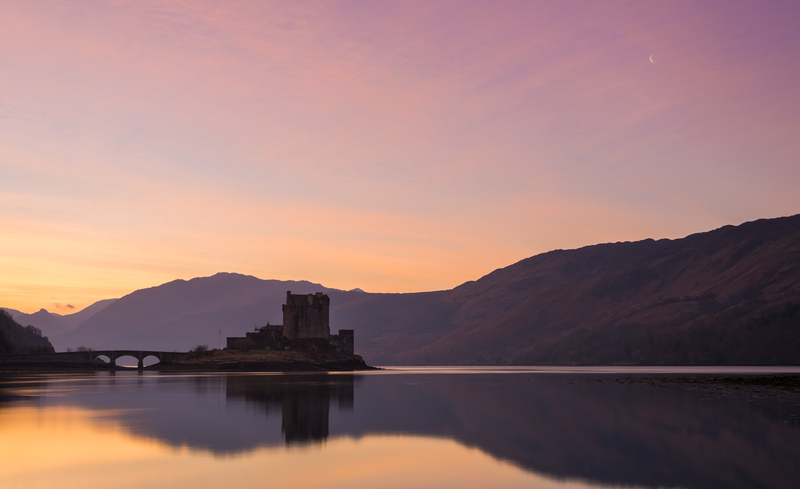 Eilean Donan Castle has featured in many, many films over the years. When I think of Scotland this is one of the scenes which immediately springs to mind. This is probably cheating a little. 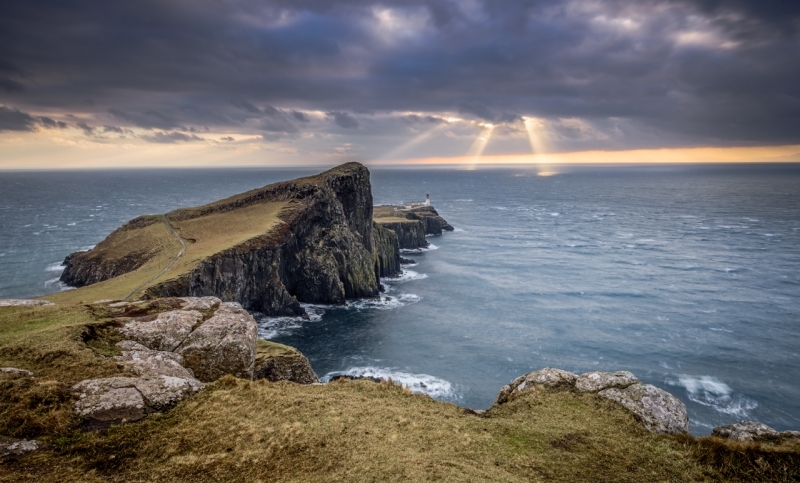 It is not actually on the Isle of Skye but very close. 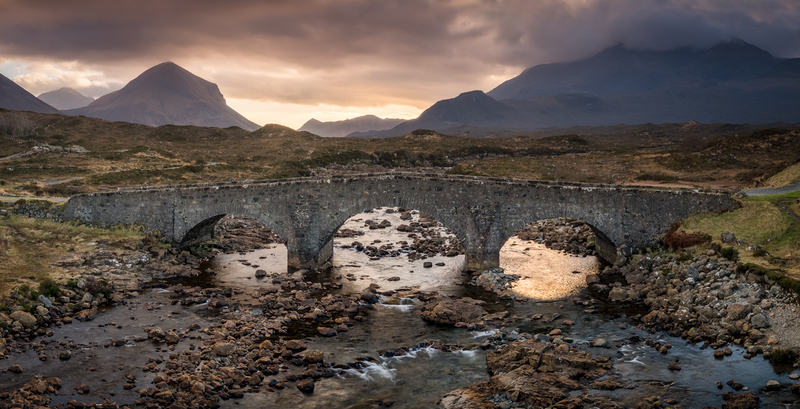 Situated on the main road south of Skye Bridge, it is an easy location to find thanks to the many sign posts along the way. 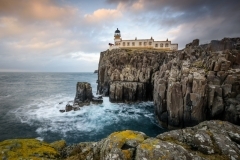 It is often shot at high tide and in the blue hour for dramatic effect. It is flood lit at sunset and looks dramatic with a blue background and beautiful reflections in the water. Be warned, the tide creeps in here quickly. The first image below was shot at sunrise and the second image shot shortly before sunset. 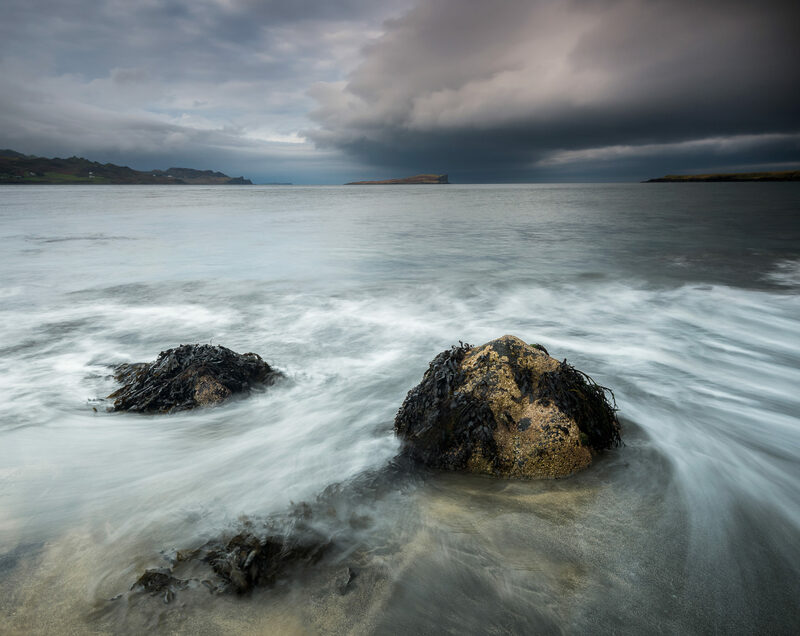 There are many angles to shoot from – I recommend High tide or as close to it as you can get. 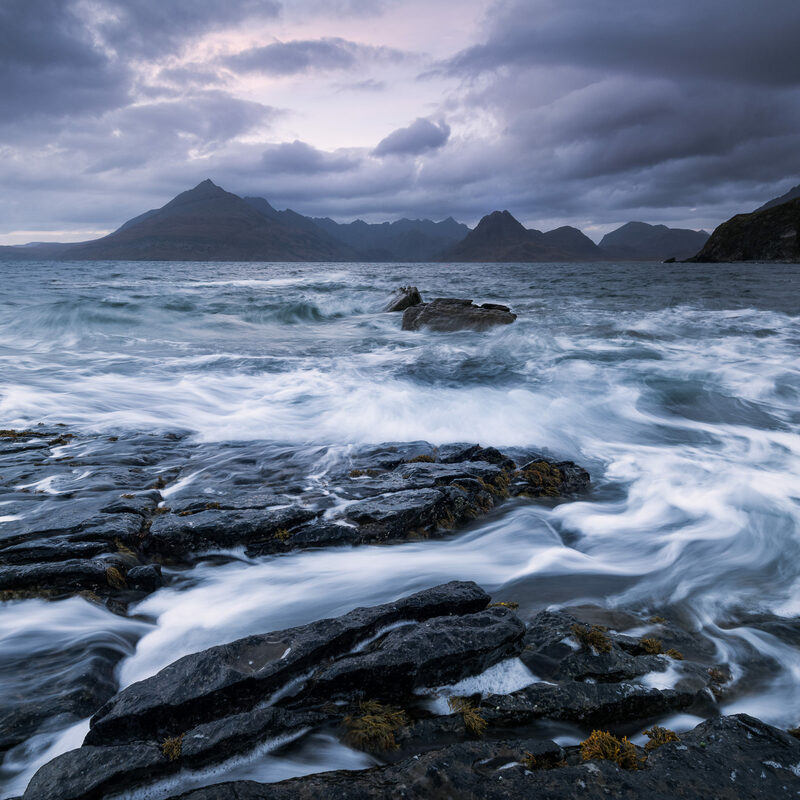 A remote but easily assessable location, Elgol beach is world renowned and admired by photographers across the globe. Take a right hand turn in Broadford village and follow the road past Kilbride and Loch Slapin. When you can go no further along the tiny one lane twisting road, you are there. Don’t expect to be alone as it is very popular. My 1st visit coincided with 8 other photographers covering a beach which is about 300 metres in length. I imagine that was quiet for a weekend. My second visit in January was very quiet and isolated. Park in the carpark and walk to your right hand side. The most interesting rock formations lie just past the headland visible from the pier. 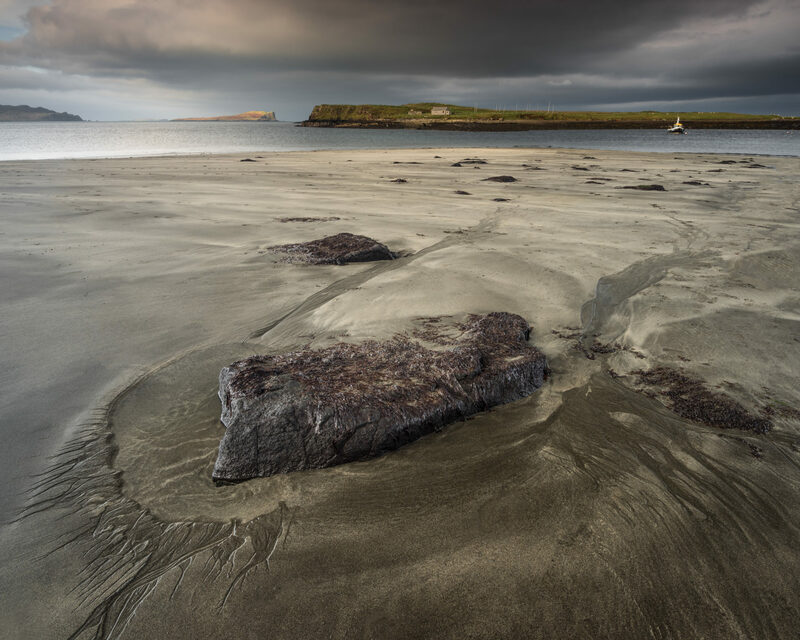 I have been here in both high & low tide conditions and both offer different and equally interesting opportunities. There are beautiful rock plateaus and formations everywhere and you can literally just point your camera towards the background and make a decent composition at any point along the beach. The famous beach ball boulder lies at the very far end of the beach. Wide angle lenses reduce the size of the mountains in the background. It can be a tricky affair to replicate the scale of the scene in a two dimensional image. I used soft grad filters to balance the light here. I have yet to experience this location in for a glorious sunset, bit overcast weather can be equally dramatic. This is a location not to be missed. What can I say that probably hasn’t already been said other than to relay the disasterous morning we encountered at the location. 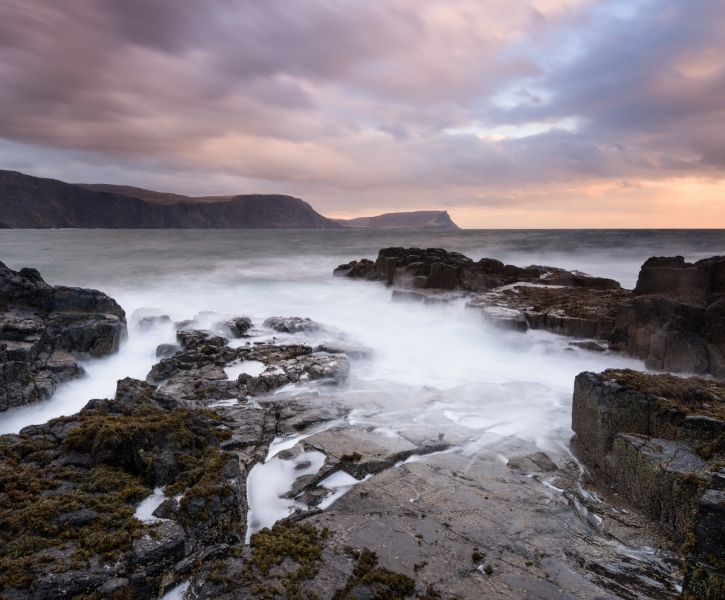 This is probably the physically toughest location on the Isle of Skye. 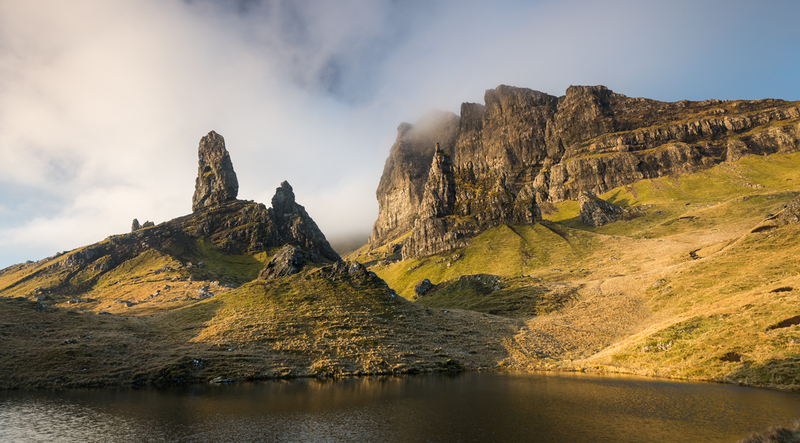 The car park is easily found 15 minutes north from Portree along the main road. When we arrived it was dark, windy and the rain was driving at us sideways. Planning had not been the best as we assumed we could plan each day the night in advance given we had a rough idea of what we wanted to do. 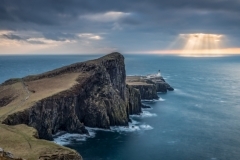 Phone coverage on the Isle of Skye appears to be terrible. We found it next to impossible to get any internet connection, even in our hotel. This made detailed planning tough but to be fair this probably should have been done long in advance. We could see the well gravelled path so off we went following it. There was a French guy watching us in disbelief shaking his head as the weather was so bad. It should have been a simple 45 minute hike. We assumed that as the sun started to rise we would see more in front of us. The hike was only moderately tough but the path eventually turned to mud and stone. We could see nothing around us and we ended up veering off the path and found ourselves lost. At no point where we in any danger, we were just worried we would miss the shot. As we stood debating (arguing) what direction to go next, the cloud parted momentarily. What a shock we got. All 3 of us exhaled the word wow together followed by a huge outburst of laughter. We were stood beside the old man itself but could not actually see it as we were in the clouds at this point. When it revealed itself, its sheer scale knocked us sideways. Any pictures I have ever seen of this monster do not do justice to its sheer size. Its colossal. We were back on track and made our way up the ridge to the traditional viewing point hoping that the rain would stop and the cloud would clear. We stood in the driving rain for an hour but the cloud showed no sign of parting and we knew it was a lost cause. The Old Man had well and truly beaten us on this occasion. The rain and mist were so bad that it managed to seep through a coat which has never let water in before. We headed back down the mountain and grabbed a couple of shots as we descended. The cloud literally hung over it for the 3 days we were there and it could not be seen once on our visit. Frustration does not start to properly explain what I felt as it was the one shot on the Isle of Skye that I wanted to capture above all others. A change of clothes, a bit of early lunch and a pint later we were on the way to the famous fairy pools. The lady who ran our accommodation warned us to expect crowds here and she wasn’t wrong. She actually advised that it is best to visit this location either very early or very late in the day as the crowds are not so prominent at these times. We did not have that luxury as we had a lot to fit in to the trip. 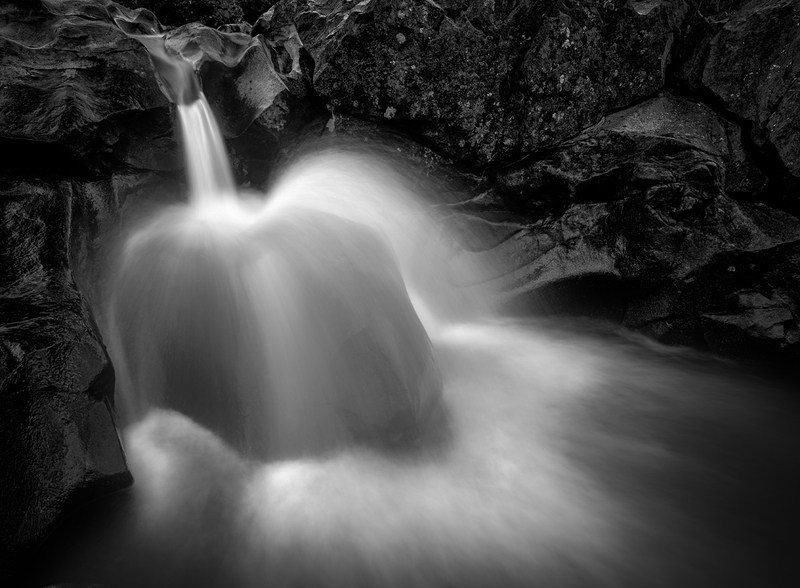 The fairy pools are actually quite a gentle walk with many beautiful waterfalls flowing down from the Cullins range. I have never seen a river so clean with fast turquoise coloured water flowing by. Next time, I’m bringing shorts for a swim in some of the deeper pools. The path is clean and well maintained but it can get a little muddy off the track. I recommend wearing wellies or waders for this location. The river is deeper than it looks and I struggled to cross it in places – at one point I found myself hanging dangerously from a tree branch to get my shot but that’s a story for a different day. 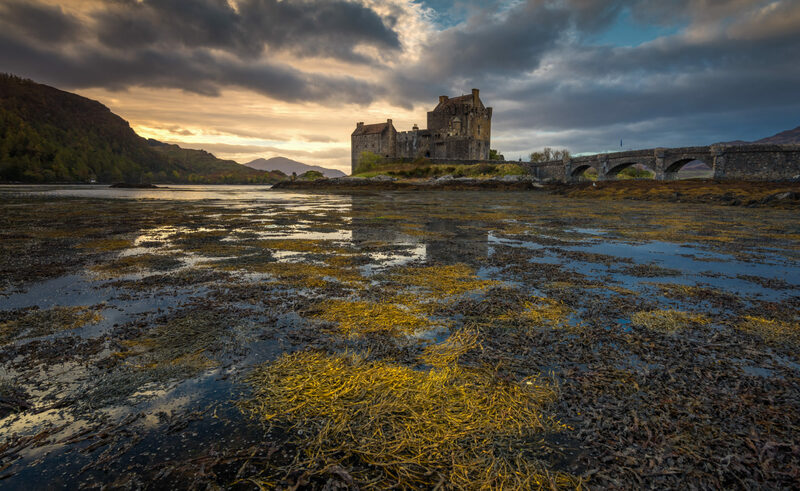 A polarizing filter is a must for this location to help remove glare from the wet rocks, reduce shutter speeds and remove water reflections allowing you cut through the crystal clear waters to the pebbles below. There are crowds here and people do get in your shots. The good news is that they don’t tend to hang around, they keep moving along the track. 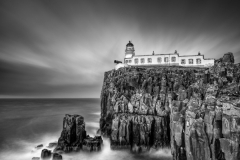 Set-up your composition and just wait until it is clear before tripping the shutter button. Again, low cloud left us with dilemas as the mountain in the background was hard to see clearly at times but we made do. We had planned an hour at this spot but spent 3 and could have easily spent more only for we needed to get to our next location. I would particularly recommend this location late on a summers evening as a nice sunset would illuminate the mountains behind beautifully. This is one location I don’t see a huge amount of work coming from despite the Isle of Skye being such a popular location. 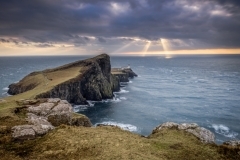 It can be assessed by parking at the gates of Talisker house and walking along the lane for twenty minutes. It is remote but beautiful. I was surprised to find we were the only photographers on location. The tide was in high when we visited but from my own research, I believe it appears equally suitable for low tides as well. There really are only a couple of shots available from this location at sunset. 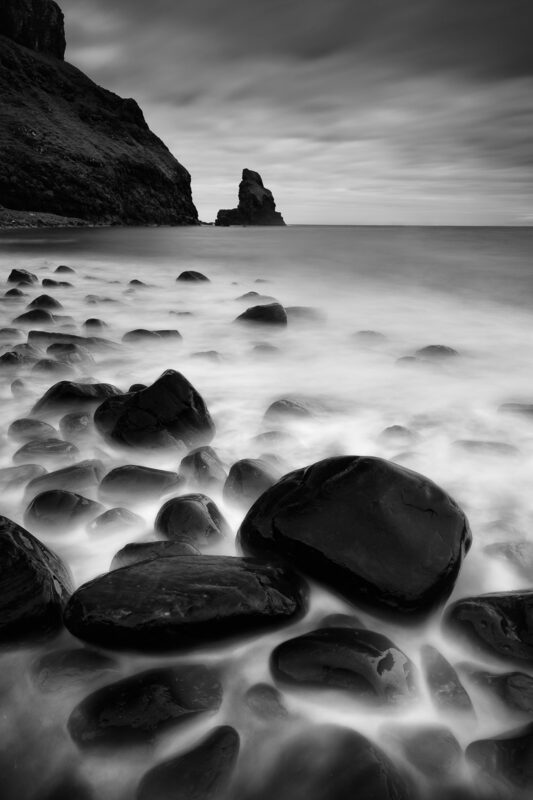 These involve using foreground boulders as a leading line to the sea stack in the background. 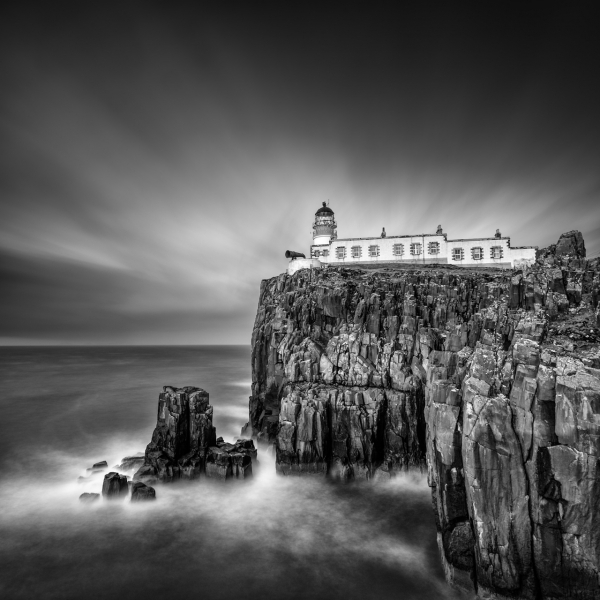 Dull weather left us shooting for mono images. Again I used the trusty polarizer to reduce glare from rocks and extend shutter speeds. I would love to see this location in its full glory with a colourful sunset. The view back from the beach looks like it could have a lot of potential for a sunrise shoot as the ridge formations are spectacular. Wow, Wow, Wow – I really didn’t expect much from this location but I got a pleasant shock at its sheer beauty followed by a not so pleasant shock. We were up early for a sunrise shoot. 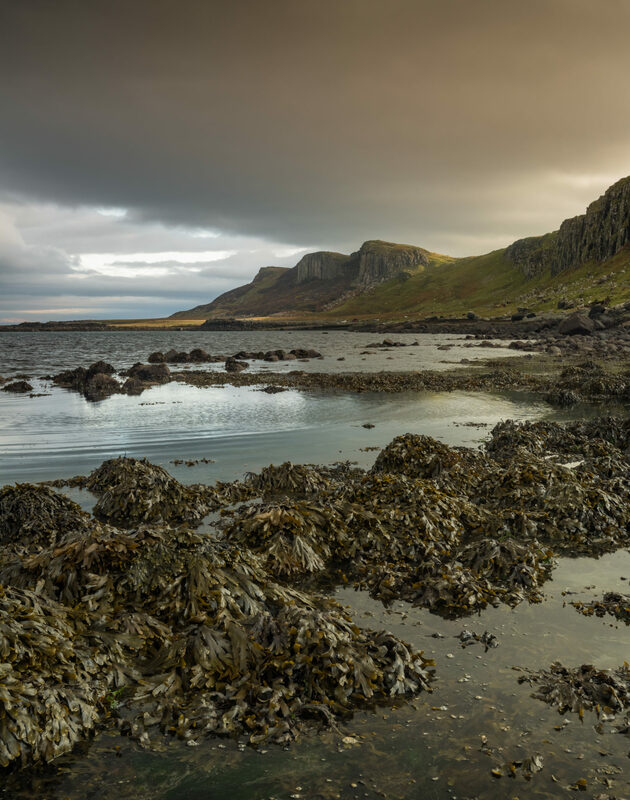 It is sign posted to the left just north of Staffin which is about a 30 minute drive north of Portree. You can drive right to the top where you will find a car park. To the north lies a well-worn ridge where most of the iconic shots come from. It is flat and easy to walk. Well protected from westerly winds we were very comfortable for the entire time we stood there. 400 to 500 metres of walking is the most you will do here. I can see why it is shot so often as there is no level of fitness required. The next time I visit, I might actually stay lower down and base myself close to one of the lakes for a sunrise shot. We had a lovely burst of light for around 5 minutes and I managed to capture a lot in that time. 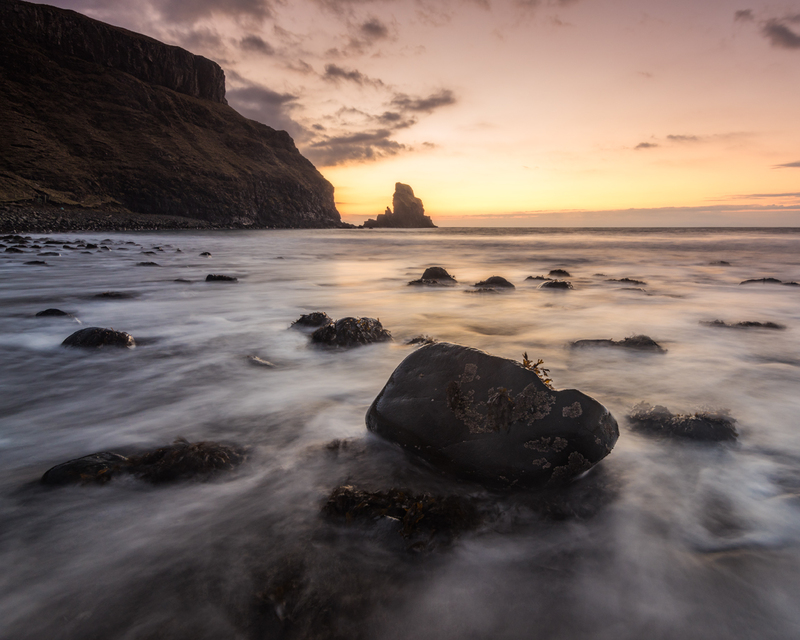 This was one of the physically easiest locations on the Isle of Skye. To the south lies a large ridge which involves a tough climb. At the time of our visit the wind was gusting strongly from the south west which made it even more difficult as we had to face it almost head on. All guides advise you avoid the area in these conditions. Did we listen – No. Myself and Michael headed up. We left Richie where he was. Our legs were burning after about 5 minutes possibly due to the effects on our bodies from the climb at the Old Man of Storr the morning before. It was far too dangerous to get as close to the edge as I needed to get the image I wanted so I had to make do. After around 10 minutes I turned to look for my shooting colleague and he was nowhere to be found. No tripod, no camera bag, no Michael. I walked around and could not find him and started to fear the worst. Screaming his name from the top of my lungs, it was impossible to reach the edge and take a look across. I had no reception to try and call his phone. My only option at this point was to head back down the hill hoping he was making his own way down already. As I walked, I kept looking down and up the hill waiting for him to appear. I was within 10 metres of reaching Richard who knew instantly by my face that I was worried and why, as Michael was not with me. Thankfully Michael appeared back in our sights at the top of the hill just after this. He had taken shelter behind a large ridge further around and could not hear anything due to the strength of the wind. It was time for the best breakfast and cup of tea I’ve ever had in my life. This is on the main road towards Staffin and again is very well sign posted. There is only one shot here and only one photographer can get it at a time. It is nerve racking bringing your camera so close to a cliff to try and get a composition that does not involve a railing. There is not a lot else I can tell you other than to try and visit at a quiet period either end of the day. As we were walking away, two buses of Japanese tourists arrived and flooded the location. 5 minutes later and we would not have got the shot. We hit this location early afternoon – I hadn’t expected a huge amount from it to be honest. The light was strange and moody. 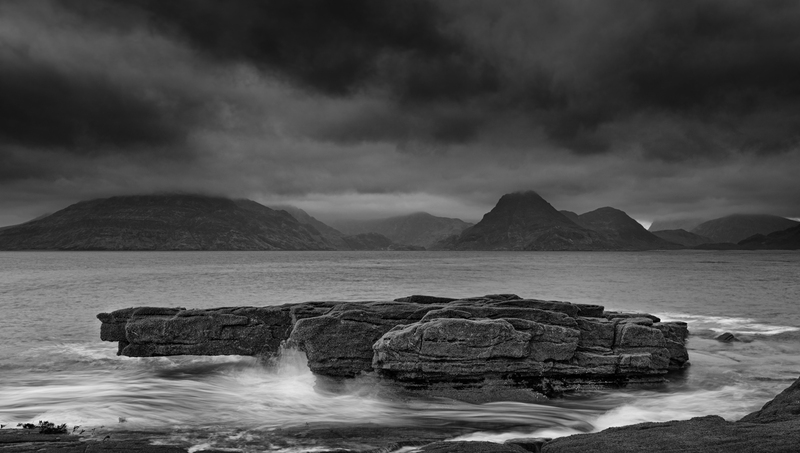 There are tonnes of compositions to be found and we spent the best part of two hours shooting here before rain closed in. I think it is another location perfectly suitable for sunrise possibly mid tide. There are rocky features to the south looking back onto cliffs, a small beach in the middle of the bay looking towards a couple of small islands. 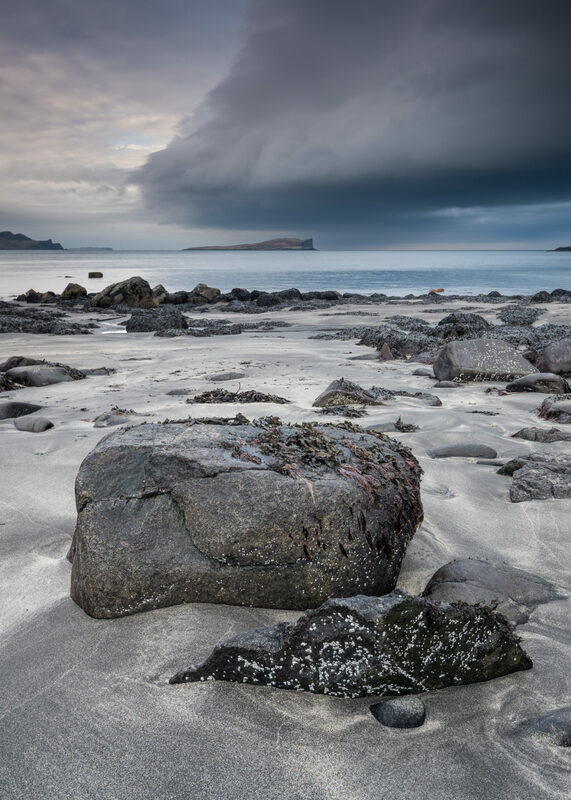 To the north is another beach full of boulders with beautiful textures. I can only imagine tides here make it a different location at every visit. The water was very still for our visit as the bay is very well sheltered from western winds. We didn’t have time to search for the famous dinosaur footprints. 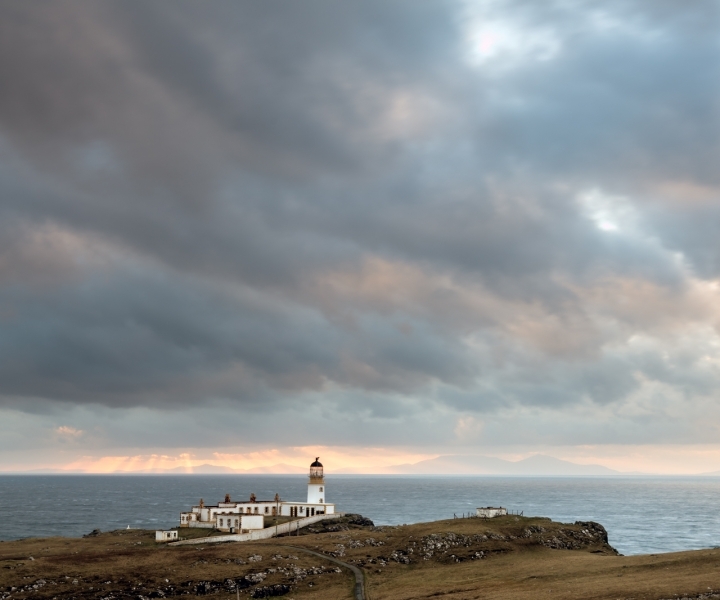 This was our final evening and we had saved one of the best for last – Neist Point. 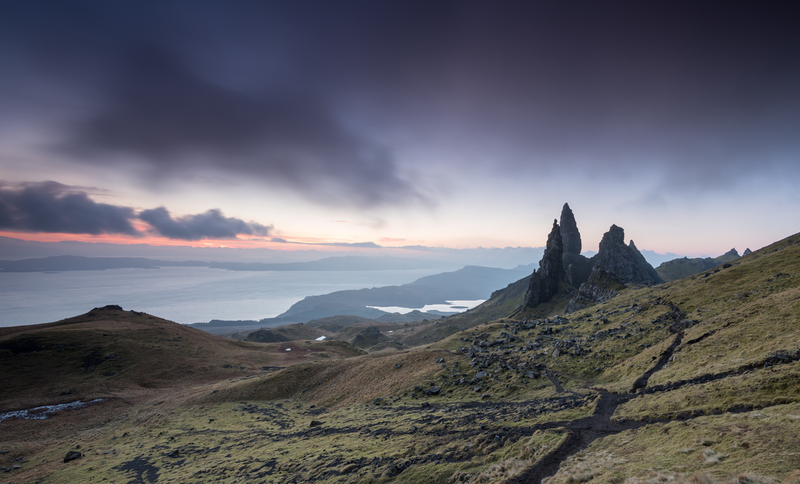 I keep repeating myself but I really wasn’t prepared for the sheer scale of the locations on the Isle of Skye. Photographs found on-line are deceptive. If you ever intend visiting give yourself a full 3 hours to shoot it. 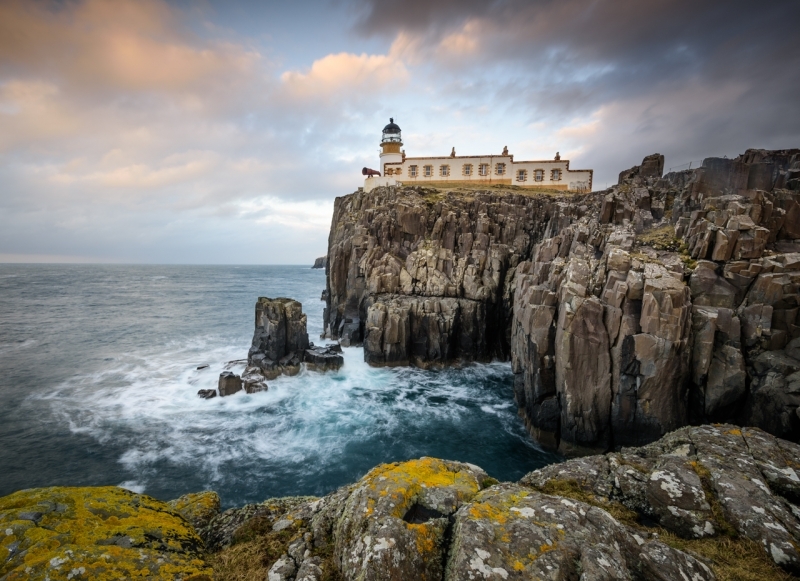 Between the cliffs and lighthouse there is plenty to shoot and it will take a bit of time to navigate. It’s a sunset location that takes around and hour to drive to. It is quite remote so make sure there is plenty of fuel in your tank. Our visit was very frustrating as it was raining heavily with strong winds preventing us from taking the cameras out even with the shelter of umbrellas. A location to revisit for sure. We had saved this for the last morning as this is where we were staying. 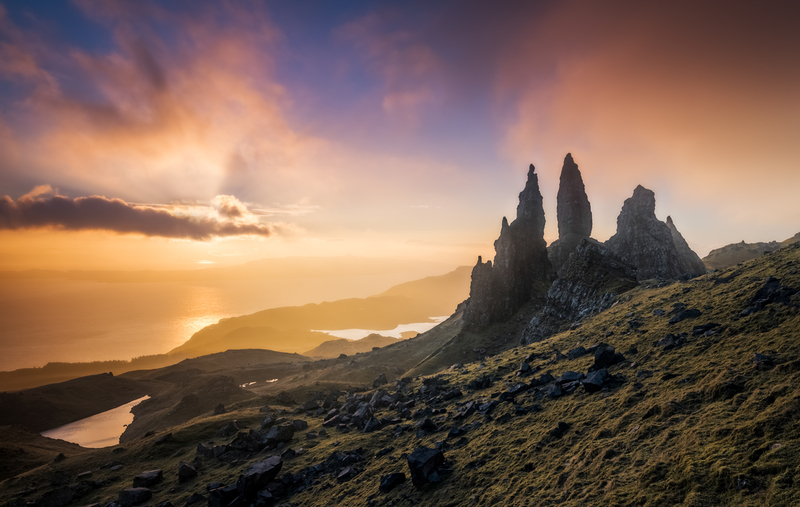 It is quite central to the Isle of Skye. It would give us an easy shoot before we departed for the airport (or so we thought). It was dull and the rain persisted. The river was in full swell and we could not see the mountain range behind it. We still had a go but to no avail. I gave up after two minutes realizing there was not going to be a shot on this occasion and there was little point in venturing any further up the river. I didn’t get a fraction of what I would have liked from this visit. 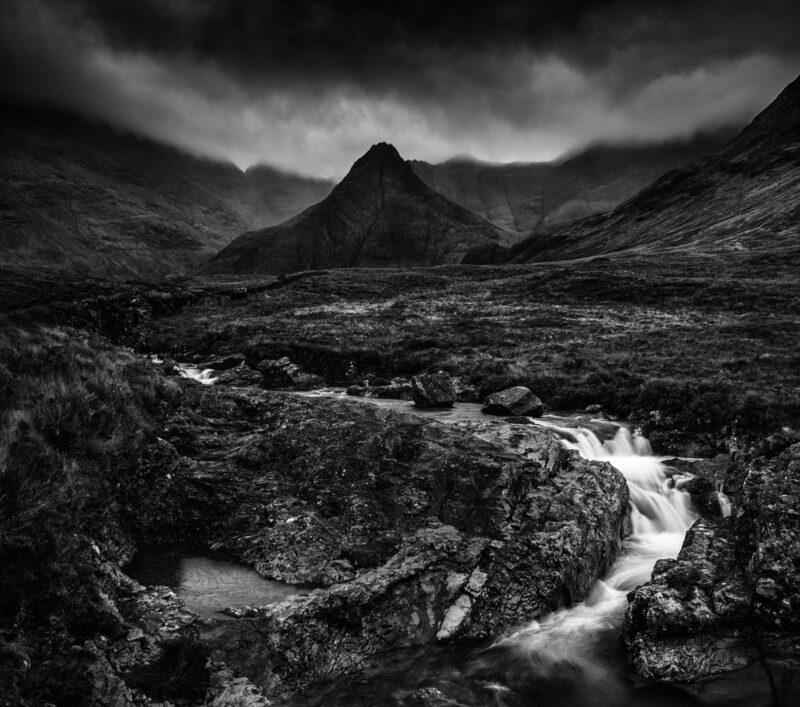 I will be making my way back to the Isle of Skye again soon, hoping for some decent weather. It was a real pity we lost so much shooting time to bad weather but this is just a part of the game of landscape photography. The people were very friendly and the food was good. I’ve been advised that crowds during the Summer months are horrific. I may give that time of the year a miss for the moment and take my chances next Spring. Help me spread the word - please share this post!!! 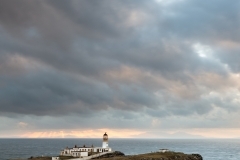 Ah the joys of weather on Skye! Some lovely photographs Graham and by all accounts you’ve got plenty of locations ready for your next visit. You could literally stop anywhere and find an image to make. Still have to conquer The Storr lol. 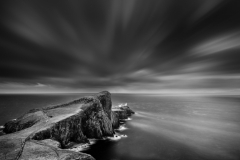 Neist point is also a must for me…….